With our second backpacking trip aborted due to so much rain, we spent the next three days taking day trips from Anchorage. Our first day trip was to Talkeetna, approximately 2.5 hours away unless they are doing road construction in the summer which makes the trip over 3 hours. An alternative to driving is take the train, though it is very slow moving. Talkeetna which began in 1916 after being chosen as the district headquarters for the Alaska Railroad is located at the confluence of three rivers, the Susitna, the Chulitna, and the Talkeetna. Approximately 800 people call Talkeetna, the gateway to Denali, home. We stopped by the Walter Harper Talkeetna Ranger Station on the northside of the small town to watch the Mt. McKinley film. It is only 19 minutes and plays regularly. The film was very eye-opening, and confirmed I would not wish to make the three-week journey up to 20,000+ while waiting out drastic storms and low temperatures even in the summer. The elevation gain is more than that of Everest due to the low base camp. As an added bonus, there are currant bushes right outside of the building for picking a few berries! At the north side of town, is the confluence of three rivers. The river is GIANT with a FAST moving current for its size. It’s worth taking a look and walking along its shore. Talkeetna’s cemetery features a memorial to the climbers who have lost their lives on Mt. McKinley (Denali). This restaurant (and lodge and cafe) has been around since 1917. The Roadhouse serves giant breakfasts and fantastic reindeer chili. It’s family style seating invites customers to meet one another. Be sure to save room for dessert. The cookies at the café are excellent! The bottom floor of the Sustina Salmon Center features a variety of local art and trinkets which are very nice. The stairs to the second floor include fun facts about salmon. Aquariums with salmon line one corner of the upstairs while a movie plays in another room. I didn’t know much about salmon, so I found the Center interesting. Plus, the heat was running, and it was cold outside! Stop in Aurora Dora and admire this gallery’s Northern Lights photography. The woman running the gallery is the photographer and she knows exactly where and what time she took each image. Talkeetna is the hub for climbers flying to Denali base camp at 7,000 feet to begin their climb up North America’s tallest peak. But others who might just want to see the mountain can take the train to the National Park. It takes just over three hours and requires an overnight stay for the return schedule. 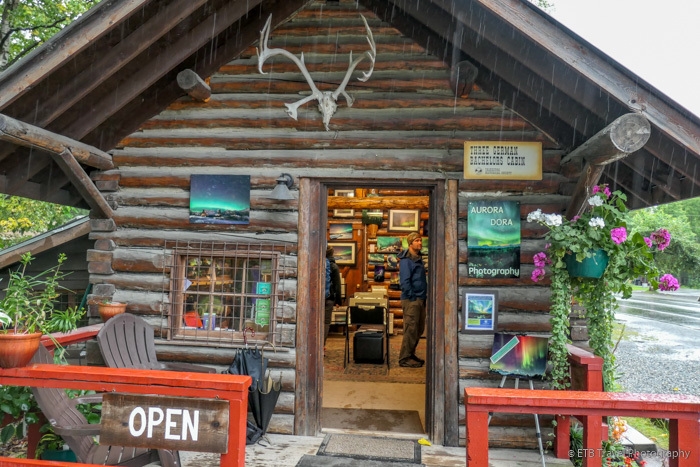 Talkeetna’s main street is line with a few restaurants and a variety of tourist shops which sell anything from antlers, to birch syrup, to native art, to hats and T-shirts. Stop in and browse the shelves.